12 months & up. The Adapta-Bench(TM) has three uses in one! First use it as seating with either a 6" or a 9" high seat. Then flip it over and use it as a table or a seat for adults. 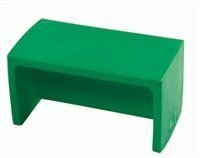 Our versatile, durable Adapta-Bench(TM) is made of lightweight, molded, waterproof polyethylene, features safe rounded corners, and can be used indoors or outdoors. Measures 30" x 15" x 15".